Preceding articles in this series, published in Pro Patria 2007 and 2008, examined regimental cap badges of The Royal Canadian Regiment. The first article described the evolution and controversy around the Regiment's use of Queen Victoria's cypher on our badges, and the second article covered a variety of rare and unusual badges. While the first two articles in this series have certainly not covered all of the history of our regimental cap badges, this third article will expand the scope of this series to include a look at the history of shoulder flashes and titles worn by the Regiment. 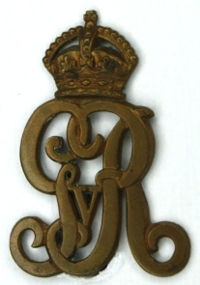 Shoulder Strap Ornament for Rank and File: The Royal and Imperial cypher (V.R.I.) surmounted by the Imperial crown, for sergeants, water gilt, rank and file, gilding metal; dimensions from top of crest to bottom of ornament, 1 3/4 inches; horizontal width, 1 1/4 inches. The Regiment continued to wear cypher shoulder strap badges in the years leading up to the First World War. Officially, and in practice when necessitated by the limited numbers of Victorian badges, the shoulder cypher would change twice, in 1901 and 1911. Despite the changes of reigning sovereigns, and the Militia Department's adherence to the traditional changes of which cypher should be the officially worn badges of the Regiment, a regimental preference for the Victorian emblem prevailed. This mixing of Royal cyphers, demonstrating regimental stubbornness in resisting change from the Victorian design became moot in 1919. General Order number 53 of that year confirmed that His Majesty King George V was "graciously please to approve of The Royal Canadian Regiment retaining in perpetual use the cypher "V.R.I." on the buttons and badges of the Regiment." Before the Great War, issues of regimental badging were of concern where the desired use of the Victorian cypher conflicted with the established practice of changing to that of the reigning sovereign. Lieut. 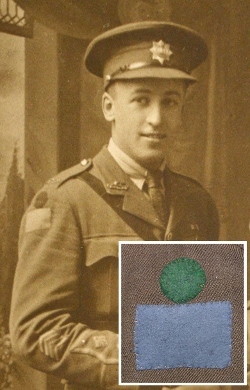 Rupert Murray Millet, M.C., showing the wearing of regimental badges on officers' service dress during the First World War. (RCR Museum) The inset image shows a colour photo of the flashes on a soldiers tunic. 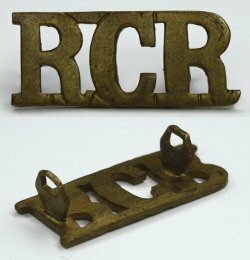 And so, the Regiment was wearing bronzed "R.C.R." shoulder titles before arriving in France in November 1915. But the early decisions to wear an RCR title did not necessarily lead to our modern image of regimental uniformity at the outset. There are a variety of pattern types of shoulder titles which can be dated to the First World War either by makers' marks or by details of their construction. 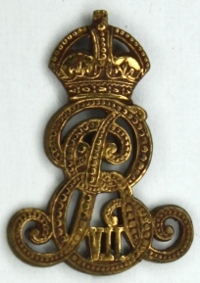 Notable among the shoulder titles which can be established as Great War issues are those with flat cut lugs (the devices mounted on the back of title or badges for a retaining brass cotter pin to be inserted), and a rare style of shoulder title with only one horizontal bar at the base of the letters. Most titles, whether issued during the First World War or later, have two horizontal bars (at top and bottom) like our modern patterns. There are at least two separate distinctive patterns of the First World War single bar shoulder titles, the distinctive difference between the two can be seen the the straight or angled ends of the letter "C". It is logical to assume that the bronze RCR shoulder titles were probably used intermittently in the field. Soldiers burdened with packs, gas mask carriers, bandoleers and any number of other items to be hung from the shoulders would not have tolerated the metal title for long under such conditions. But the War Diary notes regularly that soldiers of the Regiment spent their first days out of the front lines in "cleaning and smartening up", so there was always the opportunity to ensure that the right badges were in place before walking out to the local estaminets. 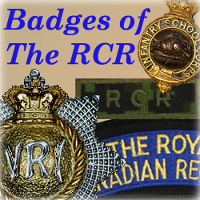 Regimental identity on soldiers' uniforms would not, however, be lost if "RCR" titles were not worn in the field. After August 1916, in keeping with the designs being adopted throughout the Canadian Corps, The RCR began wearing the divisional and brigade/battalion shoulder flashes of the Canadian Expeditionary Force by which a pairing of badges worn on each shoulder were used to designate the wearer's division, brigade and unit. The divisional patch was a 2-inch by 3-inch rectangle in a designated divisional colour. For the 3rd Canadian Division these were French Grey (after white and black were tried with unfavorable results). Above the divisional patch was a second patch, in a colour identifying the brigade (green for the first brigade in each division) and a shape to denote the battalion (a circle for the first battalion in each brigade). 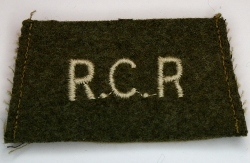 Shoulder flashes for The RCR were, therefore, a green circle over a French Grey rectangle to denote them as the first battalion of the first brigade in the 3rd Canadian Division. The first brigade of the 3rd Division was, as we know, the 7th Canadian Infantry Brigade. While the CEF distinguishing patches were not worn after demobilization, the green circle over French gray rectangle was used for years afterwards as an informal regimental designator. The CEF unit insignia was also worn in the period between the wars as an Old Comrade's lapel pin in brass and enamel. The badge, one of a series available for soldiers throughout the Canadian Corps, would have provided a unique badge for ex-soldiers, one readily identified by others with wartime experience. Although familiarity with the CEF unit identifier has long fallen out of use, a later application of divisional patches may be more readily recognized. 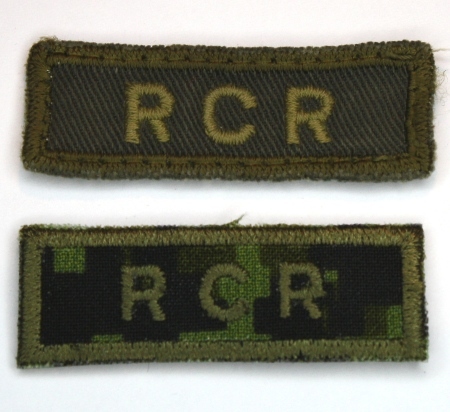 The use of coloured divisional patches would return during the Second World War and afterwards at times, when The RCR would wear the red patch of the 1st Canadian Division, but these would not again form part of a unique battalion or unit identifier as they did in the CEF. Regimental "R.C.R." titles in brass, silver and gilt finishes, depending on rank and uniform, were worn during the period between the World Wars. These titles, in their various forms and variations, would be most familiar to Royal Canadians today as the same basic pattern is worn with regimental full dress and distinctive environmental uniforms (DEU). "Regimental shoulder-badges will be worn by all ranks on the service jacket, and by warrant officers, non-commissioned officers and men on the greatcoat, one-half inch from the bottom of the shoulder straps." 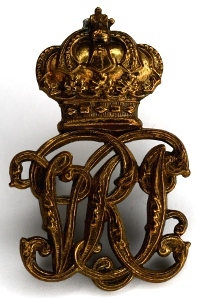 The same edition of RSOs gave further direction for officers of the Regiment, which continued the trends of similar badges being used for soldiers and officers, with the officers' badges being produced in gilt metal (and undoubtedly acquired at personal expense). 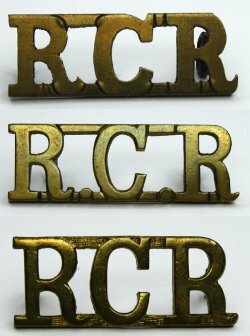 (8) Shoulder Badges - the letters "R. C. R." in gilt metal, placed 1/4" above the point of the shoulder. While metal shoulder titles prevailed through the period between the World Wars, the issue of battle dress shortly before the Second World War led to new shoulder titles. Khaki slip-ons, known as "worsted titles", were produced and issued to the Regiment. 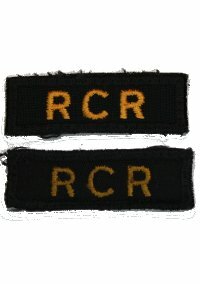 Worsted titles for The RCR were produced in two colour variations, with black and tan thread used to embroider the Regiment's initials. The slip-ons were issued in two different widths and were worn by NCOs and soldiers. Officers did not wear the worsted titles as their style of construction would have covered the lower pips of the officers' rank on their epaulets. The worsted titles, though effectively drab for a combat uniform, would not last long. Strome Galloway, in his book A Regiment at War (originally published as "55 AXIS"), describes the initial issues of the distinctive regimental shoulder flashes in blue, yellow and black in September 1940. "It is interesting to note at this point that the "flash" of blue, amber and black, bearing the words THE ROYAL CANADIAN REGIMENT, was first issued to be worn on battledress shoulders just previous to the move from Charlwood. Originally it was introduced to distinguish those actually serving, or who had served with the Field Unit, from those numerous reinforcements stationed at Bordon in Hampshire, or otherwise employed in the United Kingdom. Gradually this custom died, however. and to all those who wore the V.R.I. went the right to put up the regimental "flash"." "The shoulder flashes are designed in the Regimental Colours which are Royal Blue, Amber and Black. They were first worn in 1940, originally only by those who were actually serving, or had served, "in the field" with the Regiment. Staff, holding unit, and Home Station personnel were not permitted to wear them until later on during the war." Two versions of the embroidered regimental title were produced during the war, one with vertically cut ends resulting in pointed "tails" and a second pattern with square cut ends. Between 1943 and 1945 the embroidered wartime issues of unit shoulder flashes were supplemented by printed versions on a canvas-like cotton cloth, but only one design, the first pattern with tailed corners, was produced in a printed issue. While there does not seem to be any readily available evidence establishing when and where each type of shoulder title was first issued, both were in use during the Regiment's time in Italy. The titles were worn on shirts and battle dress jackets as well as on brassards with the divisional flash. 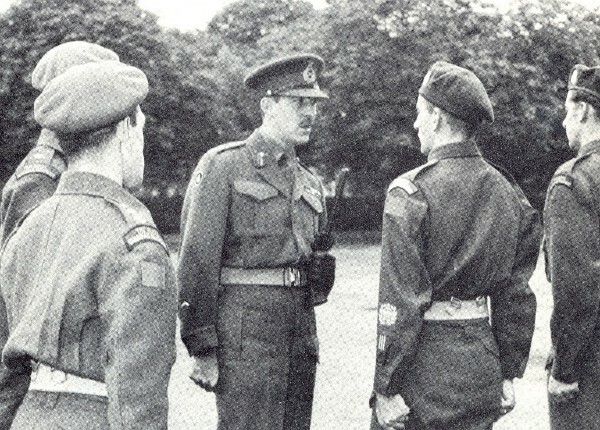 Reproduced from the regimental history (Second Volume), this photo shows both patterns of regimental shoulder flash in use in September 1945. - Maj.-Gen. D.C. Spry, DSO, speaks to CSM G.E Peppard, who was three times wounded while serving with the Regiment, at the last formal inspection of the Regiment at No. 7 Repat Depot. The 1950s saw continued use of the regimental shoulder flash, with a variety of minor changes as new manufacturers and production techniques changed, in minor details, the flash being issued. The amalgamation of the Reserve Battalion also produced a new regimental shoulder insignia. Decisions were made to retain some distinctive markings for the Reserve battalion, including a wider leg stripe on mess kit (retained at the time for cost considerations), a Fusilier White Hackle (the wearing of which ceased in 1999), distinctive unit titles (more about these later) and a short-lived unique shoulder insignia for service dress. An odd pairing of cloth and metal components, the shoulder badge was authorized in 1956. While unique, the wear of this badge would have been problematic because of its combining of a cloth element requiring sewing, and a metal badge element requiring the opening of holes for lugs and a cotter pin inside the uniform sleeve. The cloth badge was in blue melton cloth with gold embroidery (½ inch by 3 ½ inches), matching RCR shoulder flash colours. The metal part of the insignia was a collar badge as previously worn by the Canadian Fusiliers (City of London Regiment). Regimental records show that by 1959 the "special sleeve badge 'London – Oxford'" was no longer being worn and its retention was not recommended. Silver - height 3/8 inch, width 1 inch - by Officers and Warrant Officers Class 1 on [full dress] shoulder cords. Gilt metal - height 9/16 inch, width 1 7/16 inch - by Officers and Warrant Officers Class 1 on shoulder straps of patrol jacket, service dress, greatcoat and olive drab shirt slipons. Brass - height 9/16 inch, width 1 7/16 inch - by all other ranks on patrol jacket, summer service dress and greatcoat. 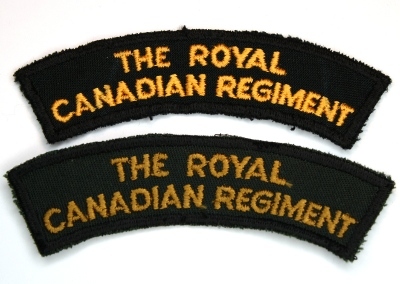 Cloth - on a blue background with a 1/8 inch black border, the words "THE ROYAL CANADIAN REGIMENT" in gold letters 3/8 inch in height. Dimensions - height 1 ½ inch, width 5 inches. Worn by all ranks on battledress and armlet. The title will be machine sewn on the battledress even with the shoulder seam, with the letter "R" in the word "ROYAL" centrally positioned. 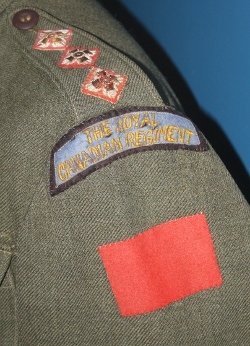 For service dress, the use of the metal "RCR" titles on service dress was discontinued with the issue of "CF Greens" the common Canadian Forces dress uniform issued following Unification. Bill C-243, the Canadian Forces Reorganization Act, was introduced by the government in 1966 and came into effect on 1 February 1968. By 1970, the new green uniform was being issued and, in its original concept, it was proposed that only cap badges would be retained as unique regimental or corps identifiers. This was soon overturned and authority was granted for new collar badges to be designed, in a smaller size than previously worn on regimental uniforms, and new shoulder badges were developed. Shoulder badges, both new flashes and new tabs for epaulette slip-ons were created and issued for the dress uniform and for a new Canadian Forces "work dress" uniform, the polyester pants and short jacket of the latter often being derided as making the wearer look like a bus driver. The new CF pattern shoulder flashes were in the familiar arc shape, but now were manufactured in a deep green to match the uniforms with either bright gold embroidery for the service dress or "old gold" thread to be worn on the work dress. The coloured regimental shoulder patch also disappeared from use with the the issue of the olive drab combat uniform replacing battle dress in the 1960s. (This would not, however, be the last the Regiment saw of the coloured shoulder title.) The olive drab combat uniform established a new requirement for matching regimental insignia. Tabs, with abbreviated unit titles in the same pattern as those designed for the dress uniform, to be worn on slip-on epaulettes, were created for the Regiment. 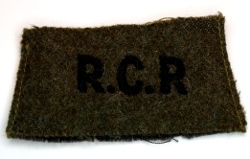 The Regular Force Battalions wore tabs with "RCR" while the Reserve battalion briefly wore tabs "4 RCR" (by some accounts, there were not geenrally issued for wear). These battalion specific titles were taken out of use and all Royal Canadians then wore the same "RCR" tabs. 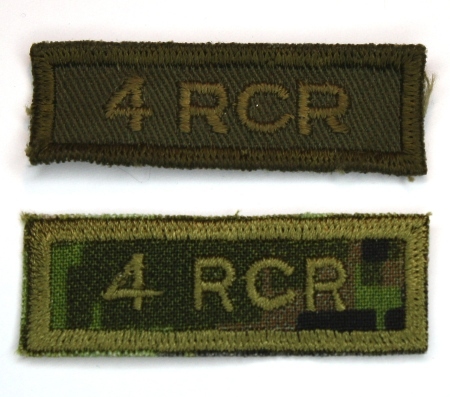 This regimental decision did not, however, prevent the Directorate of History and Heritage from creating one batch of officially produced "4 RCR" tabs in Canadian Disruptive Pattern (CADPAT) in 2008. These tabs never saw in-service use. In 1989, some bright spark in Ottawa decided that the Army should have a new garrison uniform replacing the dated and increasingly unpopular work dress. Garrison Dress was created and issued to reduce wear and tear on combat dress uniforms being worn as dress of the day, and to provide something more durable than the CF service dress for daily wear. The result was known as Garrison Dress, consisting of high boots (polishable, uncomfortable), polyester pants (ironable) and a camouflage pattern smock (which blocked neither wind nor water). This new uniform gave Sergeants Major across the Army a new uniform to expect soldiers to appear in wrinkle-free, pressed, polished and prepared everyday for a parade ready presentation. It also led to the issue of a new edition of the blue-yellow-black regimental shoulder tiles (and a new issue of locket belt buckles, but those should be the subject of another article). Thankfully, Garrison Dress was a short-lived experiment in modern military haberdashery, and the Army was put out of its collective misery in 1994. 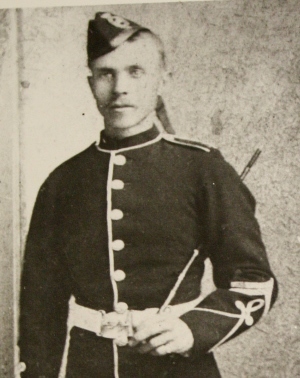 Although the shoulder titles no longer had a use for issued regimental uniforms, they continued to be used by affiliated Cadet Corps. The replacement of the CF green uniform with the current Distinctive Environmental Uniform (DEU) in the 1980s resulted in another change to the shoulder insignia worn by the Regiment. The green and gold shoulder flash disappeared from use and a metal "RCR" title returned to service on the service dress uniform. The latest changes to regimental shoulder insignia have been the need to match insignia to new combat uniform cloth patterns, leading to the creation of CADPAT titles. These have been produced for both the temperate woodland (TW) and arid region (AR) versions of this modern combat uniform. Each generation of Royal Canadian have become very familiar with the badges they were issued for wear, and many other patterns are familiar to each of us through the Regiment's consistent use of colours and designs. 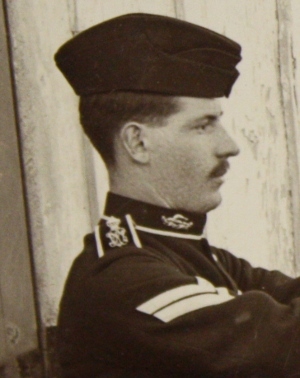 There have been, however, changes in shoulder badges over the course of the Regiment's history, including the appearance of designs that did not survive long and may be new to readers.